In case you haven’t heard, staying in is the new going out. With Valentine’s Day being on a Tuesday this year. It’s the perfect opportunity to spend some quality time together indoors. Why not try something new? Maybe you’re one for romance, or perhaps you’d rather not get involved with the gimmicks that come along with February 14th. Whatever your preference, I know of a fun idea to get you both giggling and having a good time come, Valentine’s Day. Neroli: Also known as Orange Blossom, Neroli is the perfect uplifting oil for re-energising and empowering you mood. Expect your confidence to be boosted and mood swings to be dismissed. Sandalwood: A must- have to sharpen the senses, Sandalwood taps into your imagination by letting it run wild. Empowering and seductive, this rich yet sweet scent was used as a perfume and aphrodisiac for over 4000 years. Clary Sage: Shyness be gone! This euphoria-enhancing oil gets to work on building desire and releasing inhibitions. Slightly musky and completely endearing, Clary Sage lets you get creative without any constraints. Add directly to your bath water for an incredible pampering experience. For massage, essential oils shouldn’t be used directly onto the skin, as they are highly concentrated, they can sometimes cause a reaction. Base oils are essential for blending and crafting your perfect massage cocktail. Choose from one of the relaxing carrier oils below, or feel free to mix any essential oils into your favourite lotion/cream. Sweet Almond Oil – A classic base oil that works for all skin types. Its oily texture makes it easier to glide when massaging. Grapeseed Oil – One for mature or dry skin, masseurs love Grapeseed because of its minimal odour and non-greasy texture. Jojoba Oil – This anti-irritating carrier oil is best for sensitive/acne skin types as it contains antibacterial properties. With a longer shelf life than many other oils, Jojoba oil is the ideal soothing base oil. Rose – Known for its seductive powers, Rose provokes desire and believe it or not, enhances self-esteem and confidence – it’s the perfect Valentine’s essential oil. Ylang Ylang – A well-known aphrodisiac, Ylang- Ylang is both calming and stimulating. A few drops into your bath or vapourised around your favourite room will perk your mood, whilst balancing out hyper-arousal or a low mood. Patchouli – The ultimate stress reliever, Patchouli dispels any nervous tension whilst easing anxiety. If your goal is to create a serene, peaceful ambience that promotes a sense of wellbeing, drop some Patchouli oil into your bath/massage oil. Mandarin – To promote tranquillity and serenity, Mandarin essential oil relieves nerves and pent up energy, making it a refreshing alternative to relax the mind, body and soul. Black Pepper – Believe it or not, this stimulating oil was recommended by the Romans to strengthen the male libido. Expect stamina and mental alertness to increase and tiredness to be banished when you use this energetic oil. Orange – Optimistic and bright, Orange essential oil will encourage spontaneous decisions with its enlivening, citrus blend. 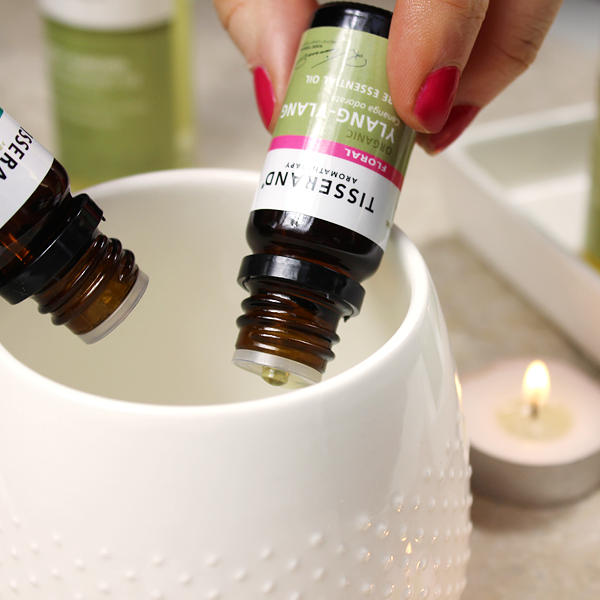 Add these essential oils to 30mls (three tablespoons) of your chosen base oil. Massage into the skin using gentle sweeping movements. • What Should You Buy This Valentine’s Day? This entry was posted on Monday, February 6th, 2017 at 9:01 am and is filed under Bath & Shower, Skincare, Spotlight On, Tried & Tested. You can follow any responses to this entry through the RSS 2.0 feed. You can skip to the end and leave a response. Pinging is currently not allowed.